As a Peruvian chef, my cooking style is firmly rooted in Lima’s criollo (creole) traditions, a unique blend of ingredients and techniques with Incan, Spanish, African, and Chinese roots that is typical of Peru’s coastal region. The flavors of this cuisine are forward and bold, evident in each forkful of pachamanca, an Incan meat, corn, and potato dish prepared in an underground earthen oven; each bite of arroz con mariscos, rice mixed with a spicy onion sofrito, seafood, and cilantro; the smoky aroma of anticuchos, grilled beef heart kebabs marinated in lime and hot peppers; and in heaping platters of tallarin saltado, stir-fried noodles with shrimp, vegetables, ginger, and soy-sauce. These traditional creole dishes evolved in Peru over the past five hundred years, beginning with indigenous cuisines, then adapting to the arrival of Spanish Conquistadors and their African slaves, winding their way through the establishment of the Viceroyalty of Peru and the founding of Lima as one of the most important trade centers in the New World, and then changing again with the arrival of indentured workers from China in the mid-nineteenth century. Limeños (people from Lima) have made this hearty creole food a strong part of their cultural identity and it’s what they enjoy for their main meal, lunch, each day. But it is a new Peruvian cuisine that has caught the attention of chefs and epicures alike in recent years, one that I did not learn in my mother’s or grandmother’s creole kitchen, one that for years I did not teach in my Peruvian cooking classes in San Francisco. 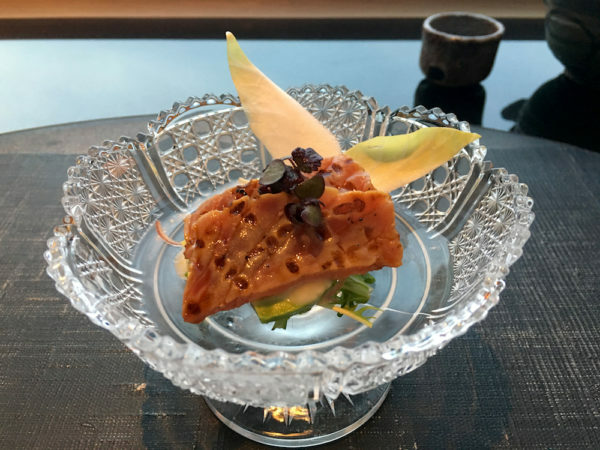 It’s known as Nikkei — a unique fusion of Japanese and Peruvian ingredients, cultures, and techniques that has exploded into the global culinary scene in the past few decades. The name Nikkei itself comes directly from the Japanese-Peruvian chefs who created it; in Peru, Nikkei is the general term for Japanese immigrants and their descendants and many of the cuisine’s earliest proponents were nissei, or second-generation Japanese. 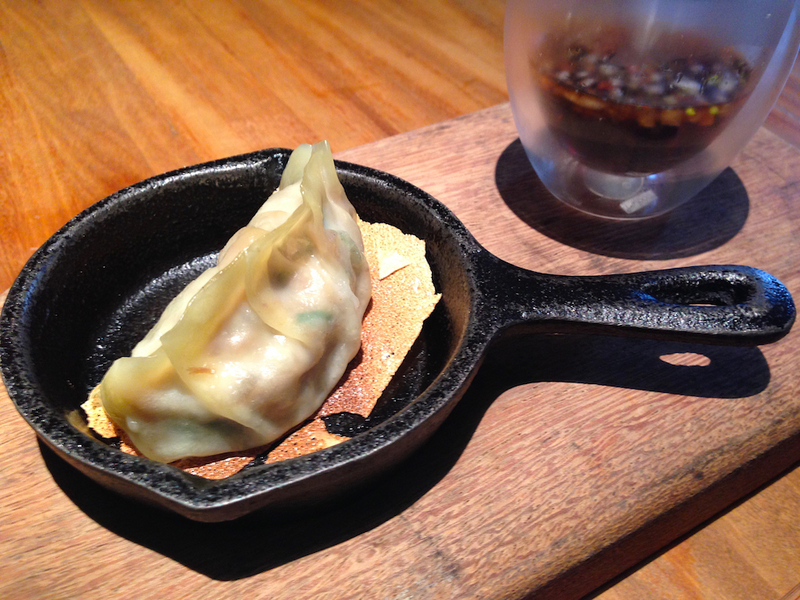 At its core, the cuisine is a combination of contradictions. Where criollo flavors are bold and festive, their Japanese equivalents are minimalist and simply cooked; in place of large and vibrant platters of beef or poultry, these Asian traditions call for small portions of seafood presented with little embellishment. Combined, these two distinct styles of cooking make Nikkei, a cuisine that is both of the world and yet firmly rooted in Peru. Nikkei’s beginning can be traced back to a single ship, the Sakura Maru, which sailed from Yokohama to Callao in 1899. On board were 790 indentured workers, all desperate to escape a growing labor and economic crisis back home in Japan. By the end of their four-year contracts, these migrants hoped to have earned enough money to return to Asia as prosperous citizens, but many instead stayed. Between 1899 and 1924 they were joined by some 18,000 more Japanese and by the early 1930’s those who settled in Lima had opened businesses such as pulperias (bodegas) and fondas (restaurants) that provided local staples and served traditional Peruvian fare. Thanks to a wave of Chinese immigration some fifty years earlier, this initial group of issei, or first-generation Japanese, had easy access to many familiar ingredients such as rice, ginger, and soy sauce for their home cooked meals. They also fished for seafood or foraged on local beaches for octopus and crab. However, their nissei children were more integrated into Lima’s culture and grew up enjoying and eventually cooking more Peruvian creole foods. It wasn’t until the mid-twentieth century that these two traditions started to merge, most famously at La Buena Muerte, a groundbreaking restaurant in Lima’s Barrios Altos working-class neighborhood. Minoru Kunigami, a second-generation nissei, opened the first incarnation of La Buena Muerte in 1958 as a bodega where he also served small bites, pisco, and beer to the local community. 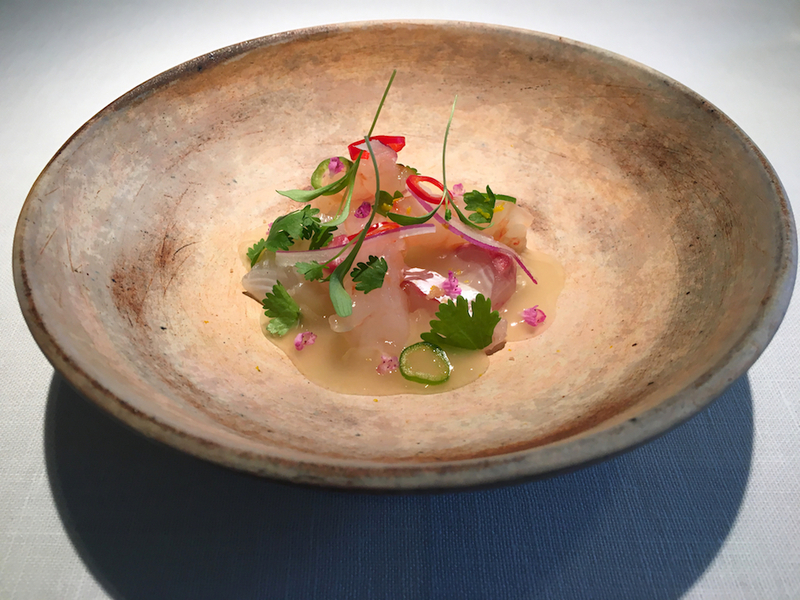 Amongst his most popular items was ceviche, a pre-Incan dish of raw fish originally marinated in tumbo, a native citrus fruit, and then in lime following its introduction by the Spanish, but Kunigami’s translation of it was revolutionary. 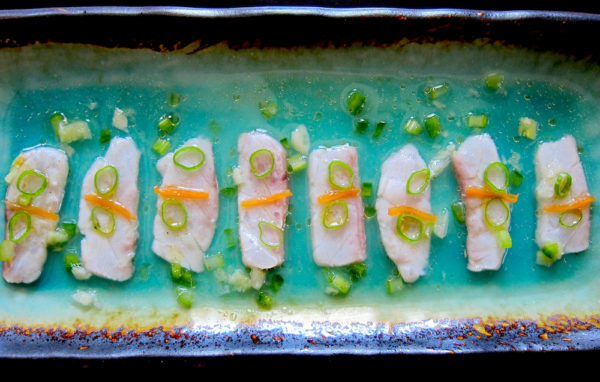 Instead of marinating the fish for several hours, Kunigami tossed it with salt, lime juice, onions, and hot peppers for only a few minutes just before serving. Fresh, almost raw, this new ceviche was unparalleled. Long queues of patrons began to form outside of La Buena Muerte, which Kunigami, with the aid of his wife and fourteen children, gradually expanded into a proper restaurant. By the 1960s, it was serving over two hundred pounds of fish each day. In Kunigama’s wake came chefs such as Humberto Sato and Rosita Yimura, who together formed the first wave of true Nikkei cuisine. Now famous dishes like pulpo al olivo, thin slices of octopus with a purple olive sauce, and arroz con mariscos nikkei, Japanese-Peruvian rice with seafood, exploded from their menus and into the mainstream Peruvian food scene. 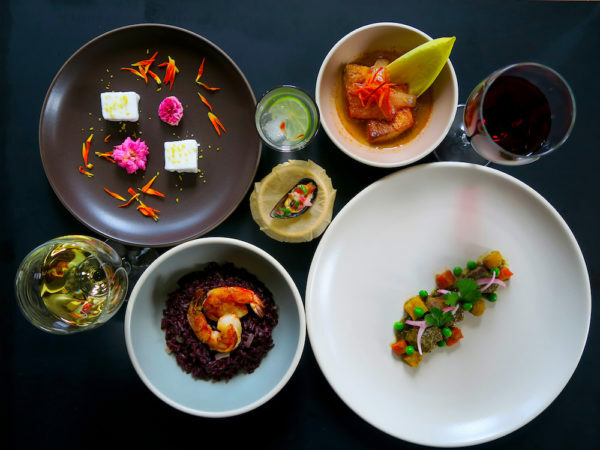 Everyone began to delight in plates with bonito, octopus, crab, or scallops and even the most traditional of Peruvian dishes were transformed by this revolutionary fusion. Anticuchos, grilled beef-heart kebabs that trace their origins back to slavery, became anticuchos de pulpo nikkei, grilled octopus kebabs with a soy sauce glaze; caldo de gallina, a version of comforting chicken noodle soup but with hen, gained ginger; tacu tacu, refried beans and rice with an onion and hot pepper sofrito, was now served with seafood. By the 1990s, Nikkei had begun to spread outside Peru, helped largely by Japanese born chef Nobu Matsuhisa, who opened his first eatery in Lima in 1974 and eventually launched a series of Nikkei-inspired NOBU restaurants worldwide. My own fascination with Nikkei began in Lima several years ago with a single bite of tiradito, ceviche’s minimalist cousin common in Nikkei. The white fish was sliced translucently thin; the curing mixture, leche de tigre, tasted of the sea, perfectly balanced with acidity and spiciness. It was Japanese sashimi with a citrusy kick. By the time I finished lunch, I had begun formulating plans for my own Nikkei menu. Though I learned to cook the Peruvian food I grew up with, Nikkei remained unfamiliar. To fix that, I started to eat. I dined on Japanese gyoza filled with cuy, Andean guinea pig, in Lima, ceviche marinated with pomegranate in Barcelona, and tempura shrimp topped with wild Peruvian mint in London. To better understand Nikkei’s own roots, I visited Japan and reveled in bento boxes at depachikas (department store food halls), yakitori (chicken skewers) in smoky street alleys, and sushi at the Tsukiji fish market. It was ultimately the traditional Japanese multi-course kaiseki tasting menus that truly changed my perspective on this Peruvian fusion. The progression and techniques of the meal mesmerized me: soup, sashimi, boiled vegetables, grilled meat, fried fish, pickled vegetables, a rice dish, and dessert. After one memorable tasting in Tokyo, I wrote the words kaiseki criollo in my notebook and realized what I wanted to create: a tasting menu rooted in traditional Peruvian creole dishes but inspired by the progression and minimal presentation of a kaiseki meal. It took almost two years, but my vision of a kaiseki criollo finally came to pass on a warm spring evening in 2017 when twenty hungry guests descended upon my cooking school. Seated at the communal table, each diner was greeted with a Sakura Sour sake cocktail, infused with the freshness of cherry blossom, and the story of the Sakura Maru and Japanese cuisine’s flowering in Peru. The meal itself started, fittingly, with the beginning of my Nikkei journey, tiradito — thin slices of cured rock cod drizzled with sesame oil and topped with a single julienned habanero. The courses flowed from there, an aromatic bonito broth soup topped with a single mussel and then my version of causa, a chilled and spicy potato purée roll topped with tuna salad and nori. While I plated this dish in front of the guests in the dining room, my sous chefs prepared the next course in the kitchen, a chicken yakitori, its smoky and umami flavors bringing me back to the alleys of Tokyo and the hints of aji amarillo (spicy yellow pepper) in the marinade reminding me of my mom’s aji de gallina, the primordial pulled poultry stew that first drew me into her creole kitchen. 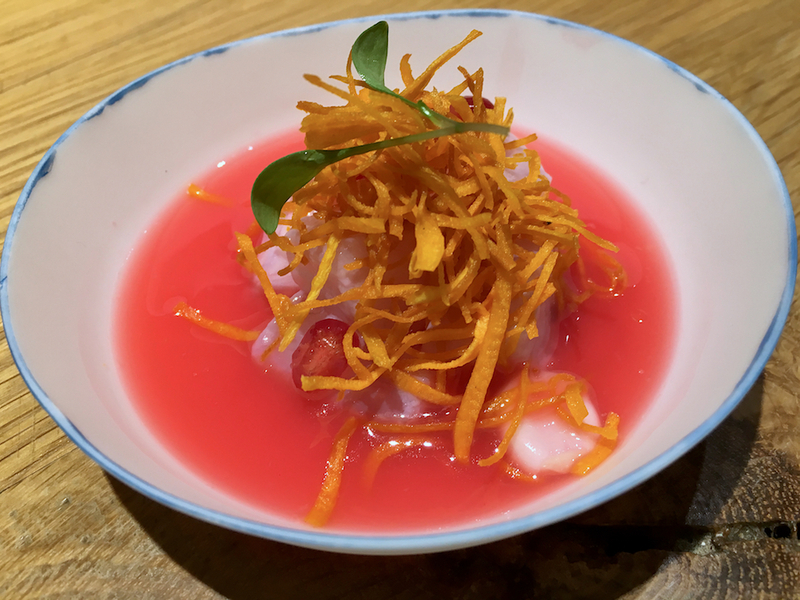 The last two savory courses jumped in from there — a dish of fried fish and pickled julienned carrots that crossed a Peruvian escabeche with a Japanese nanbanzuke, and then arroz con mariscos, the rice stained a deep purple with the stock of dry corn from the Andes. As the meal headed to dessert, a shortbread cookie sandwich with sweet black bean paste and sesame seeds, I felt calmly elated observing the guests intrigued by these familiar yet unusual flavor combinations and transported by what they had eaten. Today, for my classes and dinners I still mostly cook the traditional criollo dishes I grew up with, but cooking has been permanently infused with the spirit of Nikkei. I use my knives with more precision and mindfulness; I plate my dishes with more minimalism, striving to remove as much as possible from a recipe without altering the true essence of each dish. Even when I am not using Japanese ingredients, I try to pay homage to the cooking techniques and cuisines of both Peru and Japan. Now, I am proud to say my culinary roots are Incan, Spanish, African, Chinese, and also a little bit Japanese. Peru but now based in San Francisco.